As I have just passed another anniversary here in Zürich (4 years ! ), I’ll try not to go on and on about how much I am still in love with this city – during the hot, sunny summers, in the rain, in the snow, in the winter, spring, summer and fall… But it’s true. 10 years with my husband and it’s like we just met, and 4 years in Zürich and it’s like I just moved here. I never tire of the picturesque views of the mountains overlooking the lake (my reaction is still to grab my camera); and my eyes still grow wider when I turn the corner of a favorite charming street in the old town. Best of all, while continuously rediscovering the same pleasures, there is so much to discover for the first time. There is always something new and different here, be it a music festival, an art exhibit or a funny local holiday. Or my favorite (but of course), while less frequent, are the sweet happenings. 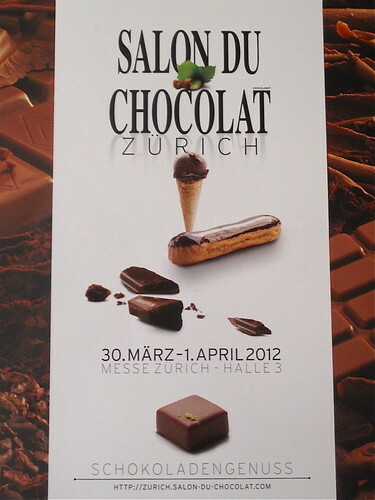 Ladurée coming to town, Switzerland’s first Salon du Chocolat and a nougat shop, to name three delicious highlights. And now here’s where you’ll most likely find me … at the new and most certainly improved Café Milchbar, which just (re)opened its doors on June 23rd. 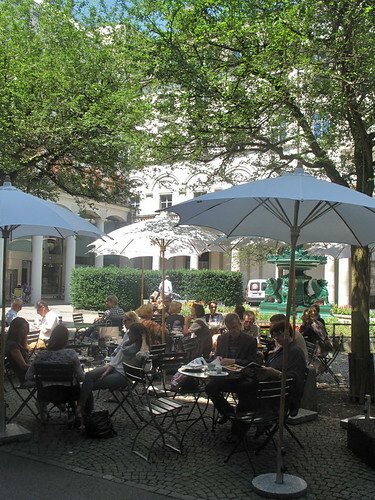 Locals in Zürich may know the Milchbar for its 35 years in a prime location, tucked away in a quiet square with a beautiful fountain; sandwiched between Bahnhofstrasse, bustling with bankers and shoppers, and the Limmatquai, with its punctual bright blue trams. But rather than boasting its vegetarian or meat options at lunch (and 5am opening time, which remains), it’s now all about the desserts ! And they’re of a very well known and high caliber, from the city’s oldest confectionery across the river, Péclard at Schober. 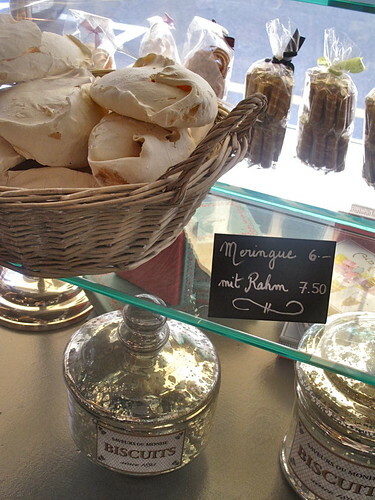 The buttery French croissants and oversize meringues are here, as well as slices of Gugelhopf on the counter. 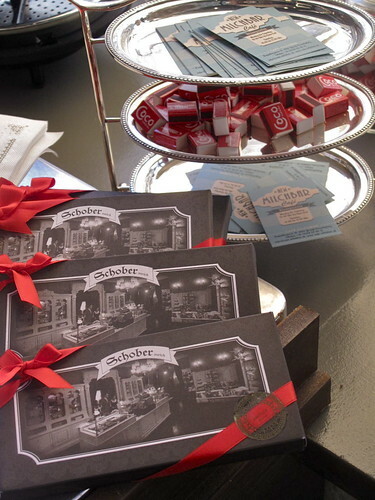 A setting both upscale and eclectic (stage builder and designer Raffi Otto brilliantly threw together dark leather, wood, faux brick and funky lighting) showcases Schober’s divine pastries, yet served in a more rustic way. Desserts are displayed on the trays they were baked on (as manager Christa said, “no schnick schnack”), not pre-sliced, so your hunger can dictate the size slice you request. The signature Cremeschnitte (millefeuille) is topped with whole strawberries and will continue to grab the spotlight until the season is sadly over. 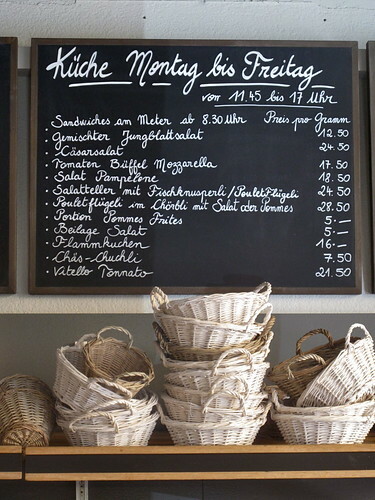 A tempting variety of breads are delivered every morning from Känzig, a personal favorite of mine, whose bretzels and fig bread always fill my market basket at Bürkliplatz. 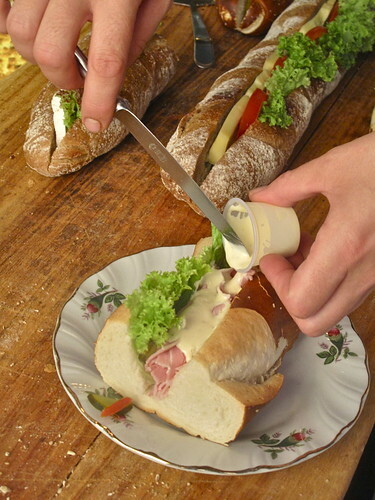 Fruit tarts and flammekuechen aside, another house specialty is the ‘sandwich by the meter’. 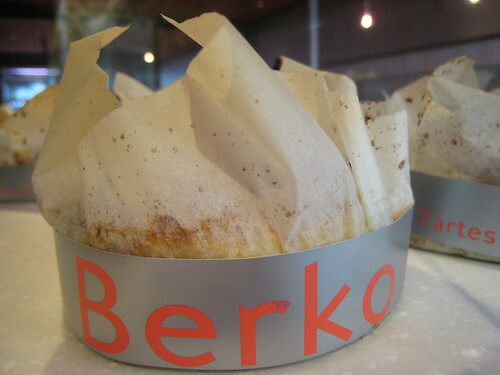 Again, let your eyes and stomach decide how big a slice, and you’ll pay by weight (CHF3/100g). The construction guys around the corner come in with their rulers and order by the centimeter – how Swiss ! What’s not so Swiss is the sauce; taking inspiration from Ocean Drive in Miami, they top the ham or cheese sandwiches with a mustard/mayonnaise blend just before serving – instead of coating the bread first, the usual step that can only make it soggy. 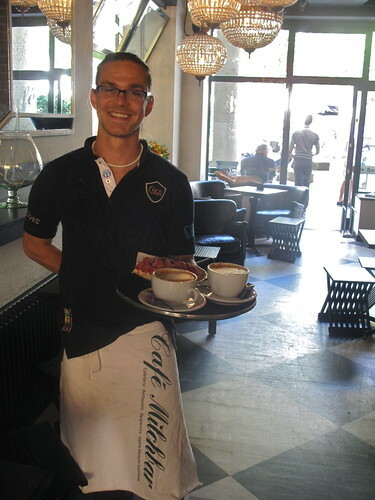 Wash it all down with a coffee, one of two blends that Ernst Knuchel, of Fresh Coffee in Ruschlikon, created exclusively for the Milchbar (and only makes 100 kilo per week). Or enjoy a glass of bubbly, as this address already promises to be a hot spot for the aperitif hour. One last thing, be sure to check out the black and white photo in the front window, taken in 1947. 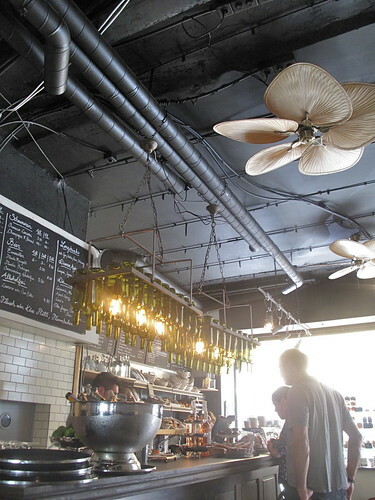 You’ll see that by bringing the Milchbar back to life (it suddenly closed in May), Michel Péclard has brought the place full circle. 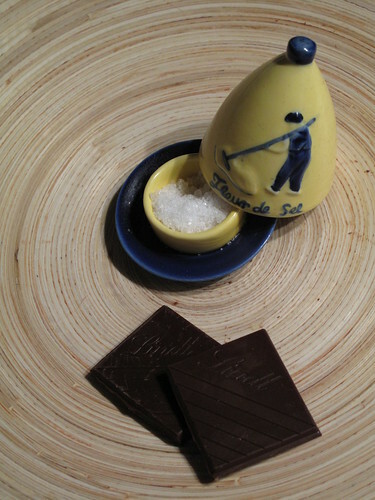 Before the popular lunch spot, it was actually a confiserie… Merci vielmal, Michel ! Mon to Sat: 5am until… 10pm, 11pm, 12am depending on the crowd ! As usual, great information and beautiful photos! Wow – 4 years! NYC really misses you!!! An extraordinary 4 full years of sharing your adventures with your readers. 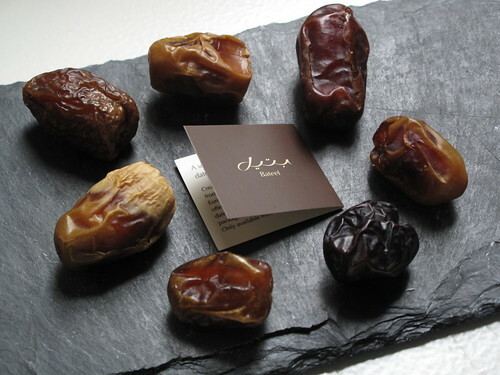 We thank you for sharing the food, sweets and sights of Zurich. I can’t wait to sit under the umbrella and have coffee with one of the treats photographed above. 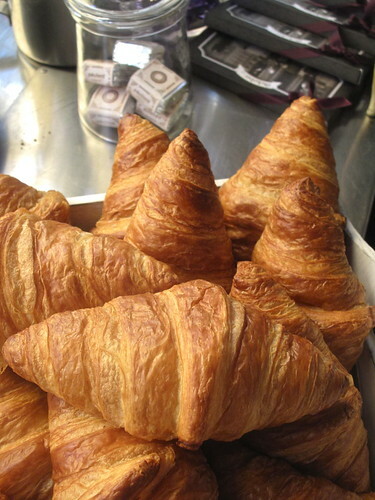 My favorite might be with strawberries…or the pastries under the glass….or sandwich by the inch??? 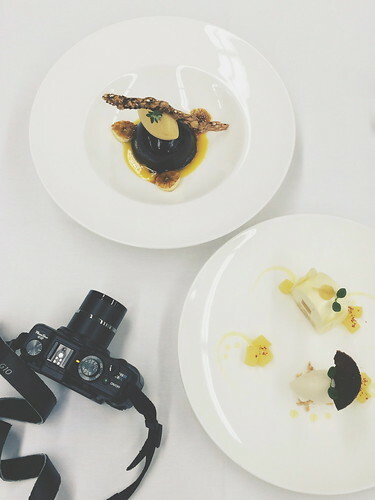 My mouth is already watering from the excellent photography. 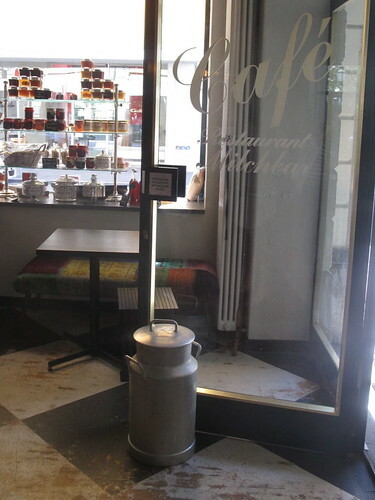 What a shame they no longer serve Henauer coffee which truly is one of the best in town but glad to hear that you are still in love with Zürich. So am I after more than 35 years. Happy 4th Anniversary! 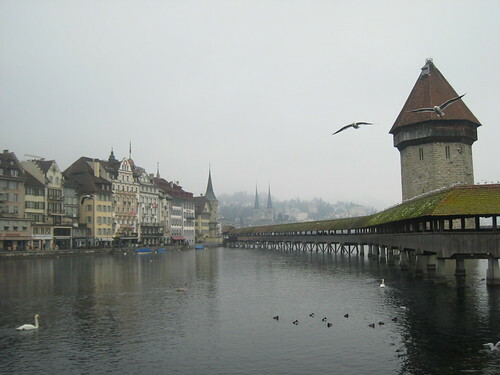 Your post(s) reminds me, yet again, that I need to spend more time exploring Zürich! But right now, all I really want to do is taste the millefeuille!! I’ve only tasted one in Switzerland that impressed me! How are the “chausson aux pommes” ? — another favorite . Ilana, thanks cbm ! 4 years. Time sure does fly by… We miss (you and) NYC too ! Lani, and thank *you* ! It is above all my pleasure to share all of that with you. Thrilled that you enjoy. As for chaussons aux pommes, don’t really see those in Zürich, would have to head more to Romandie I imagine. 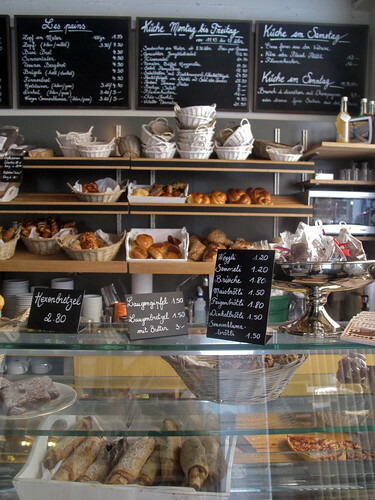 Not much French pastry in Zürich at all, apart from what Schober offers. Great post. And doesn’t that also mean 4 years of wedded bliss to Mr. Rousset!? Congrats all around are in order my friend! So proud of all that you have accomplished in the past 4 years! xo. And those sandwiches look divine! Emma, comments like yours are why I have a blog. THANK YOU. Not cheesy at all – genuine and extremely appreciated. 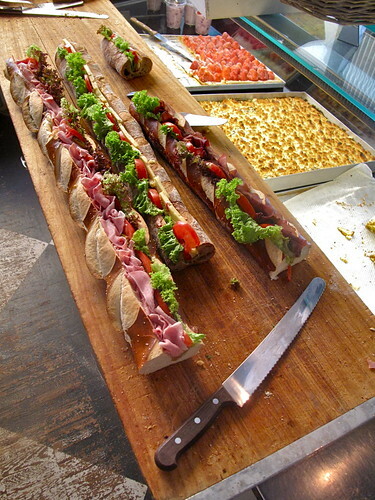 You really do need to make it to Zürich one day, and if you don’t mind, I would be more than happy to help you with your meter-long sandwich. =) And we can toast to MyKugelhopf & of agates and madeleines !! Mom and I know how much you love Zurich… and how much Zurich loves you. That makes it alot easier having you so far away. And I am sooooo proud of all you’ve accomplished in a relatively short time. It’s amazing. You’re amazing! And it won’t be long before KB will be your newest fan. How cool is THAT!!! Love you honey. You always manage to show me my own city with new eyes, thank you for that! KugelDad, what to say, what to say… thank you, grandpa to be. Congratulations on your anniversary! It’s a wonderful thing to live where your heart is happy. 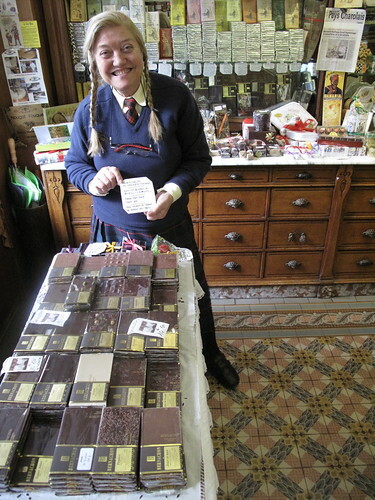 And thank you for sharing your experience over the years (and for the tip on the renewed Milchbar). Yum! Great post. Love parents’ sweet comments on blogs. Aren’t they fun to have? Hope all is well with you. I am embarrassed to say that I can not remember the name of the bakery where I had that millefeuille! 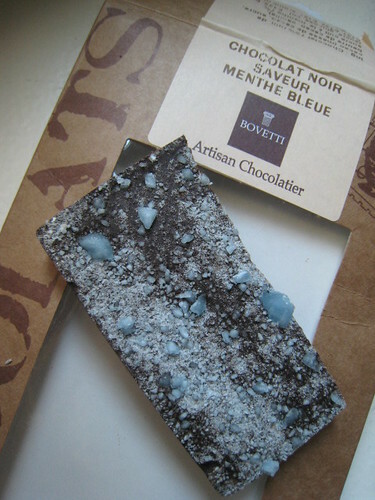 I tasted it while working in Romanel-sur-Morges some 5+ years ago. Next time I am visiting family, I will try and find it again! Making note of the one in Zermatt too! I must try it! Mmm! What an amazing post! I want all of these delicious treats right now! It is so nice to hear that you are still in love with your city (and your husband!). I recently moved to a new city, but I haven’t had the means to explore it all that much yet. I can’t wait to be wooed by it, and hopefully in 4 years time I will still in love with it! Rebecca, absolutely ! =) Sometimes, I get a little nervous though – uh oh, my parents do realize their comments are public, for all to see, right ? haha. Megan, thank you ! Good luck – and especially enjoy – settling in to your new city and new home. You will see, in time, you’ll be waxing poetic like me ! Reading you introduction I felt transported back to The Old town when I visited early this year. I did fall in love with the lovely streets, shops full of character, views of the river and lake. It’s wonderful that despite the 4 years you’ve lived there the beauty still moves you. Congratulation on your anniversary! May you have another grand year ahead. 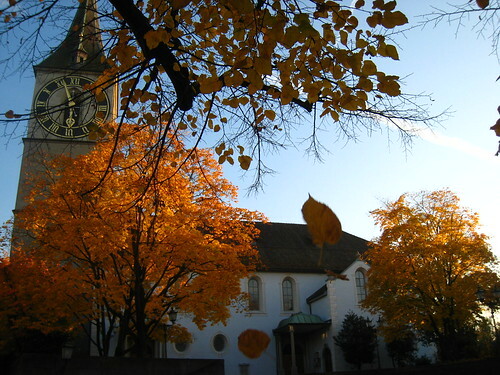 And this venue..i shall visit next time I’m in Zurich. Maybe sometime in autumn or spring. Love The fans – the blades reminded me of Asia. The venue looks really pretty and inviting. Not to mention the food. 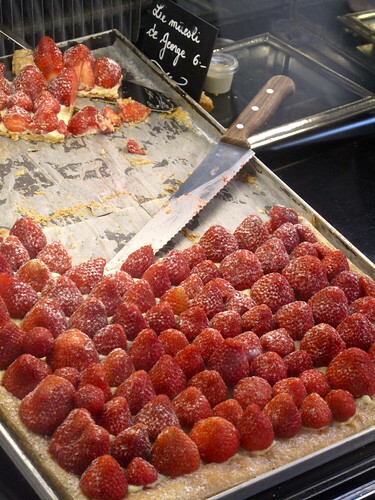 The fabulous croissants, the huge strawberry topped tart..
‘Sweetie’ future mum; I missed this one because we were in Switzie to celebrate my mum’s 85th birthday – She lives in Zurich but the ‘party’ was in a wonderful little bistro in Moenchaltorf…. Had to return to France though! 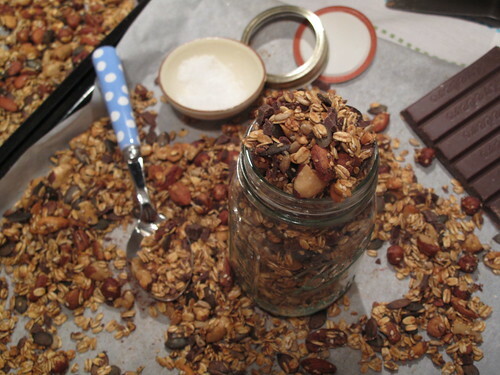 Lovely post – as always – and I’m sorry to admit that I never knew the Milchbar…. 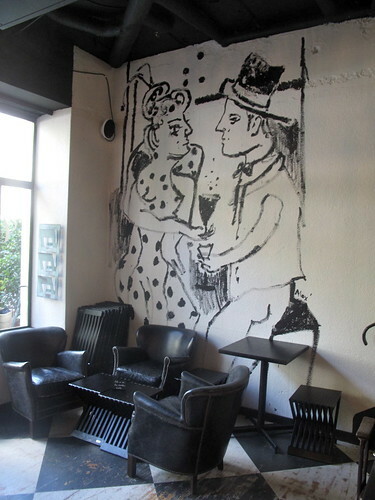 The Café Schober however – THAT one I knew only too well, RIP! Thank you for this great recommendation! When I read this post, I knew I needed an excuse to try it out, and I honestly don’t know why I hadn’t been in/noticed it before. 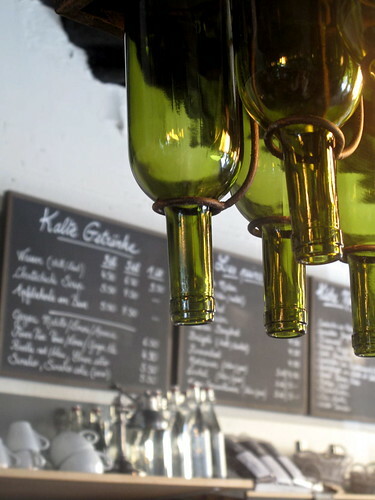 We had a great Sunday brunch there and with it’s laid back atmosphere and good food at reasonable prices (hard to find here in Zurich! ), I am sure we will be back many more times. 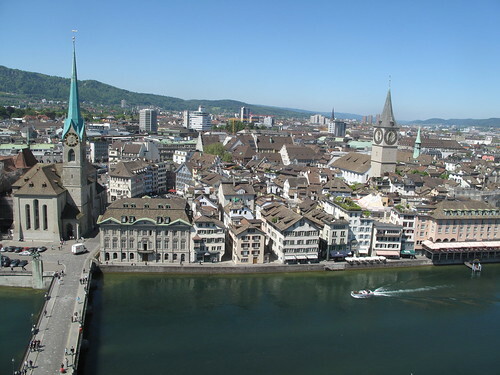 I lived in Zurich for 6 months in 2005 and it doesn’t go a month when I don’t miss the city a bit. 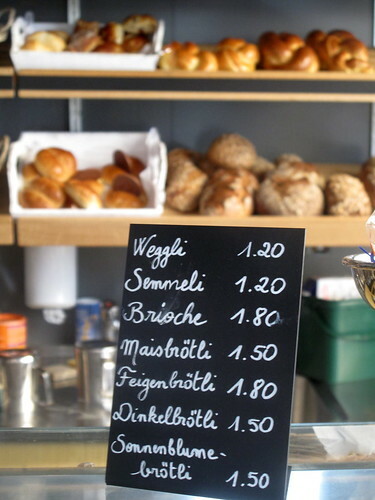 One of my favorite bakeries/cafés (don’t recall the name) was located near the Fröhlichstrasse tram stop. 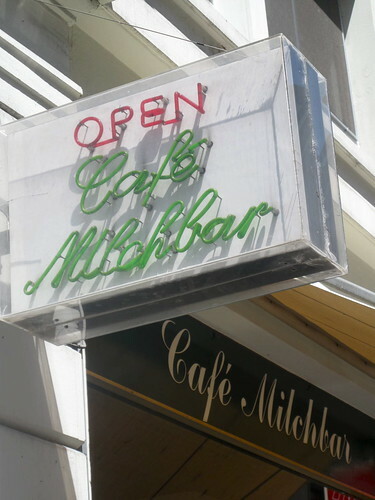 I haven’t been to Café Milchbar. Looks like a nice place to enjoy something sweet on a warm day!